Your Passport to the Universe The night sky is alive with many wonders- - distant planets, vast star clusters, glowing nebulae, and expansive galaxies, all waiting to be explored.Let respected astronomy writer Philip Harrington introduce you to the universe in Star Watch, a complete beginner' s guide to locating, observing, and understanding these celestial objects. You' ll start by identifying the surface features of the Moon, the banded cloud tops of Jupiter, the stunning rings of Saturn, and other members of our solar system. Then you' ll venture out beyond our solar system, where you' ll learn tips and tricks for finding outstanding deep-sky objects from stars to galaxies, including the entire Messier catalog- - a primary goal of every serious beginner. 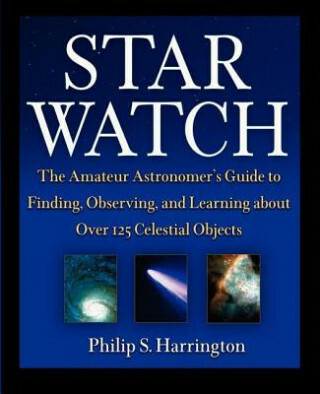 Star Watch features a detailed physical description of each target, including size, distance, and structure, as well as concise directions for locating the objects, handy finder charts, hints on the best times view each object, and descriptions of what you' ll really see through a small telescope or binoculars and with the naked eye. Star Watch will transport you to the farthest depths of space- - and return you as a well-traveled, experienced stargazer.